Goodbye, Conga Lounge (via Facebook). 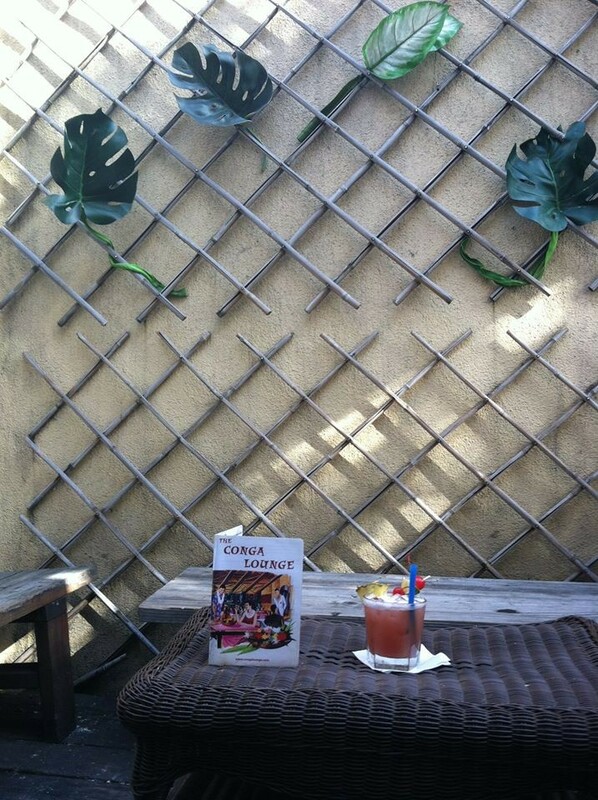 1) Bad news for the tiki bar enthusiasts among you: Inside Scoop reports that the Rockridge institution Conga Lounge (5422 College Ave.) will close after twelve years of peddling Mai Tais and Polynesian kitsch. Cafe Rustica, the downstairs pizzeria that has been a fixture on College Avenue for 25 years, will also close. Owners Michael and Manos Thanos, who run both businesses, will continue to operate the Montclair location of Cafe Rustica. The Thanos brothers told Inside Scoop that the last day of business would be Saturday, February 21, so there’s time to drop in for one last cocktail. 2) As reported yesterday, B-Side BBQ (3303 San Pablo Ave.), Tanya Holland’s upscale barbecue restaurant in West Oakland, has closed. The shop will reopen later this spring as a bakery and cafe called B-Side Baking Co.
3) Berkeleyside Nosh reports that Spats (1974 Shattuck Ave.), the offbeat Berkeley watering hole that dates back to the 1950s, is now on schedule to reopen in April. The bar’s cocktail program — which will include the old Spats signature, the “Fog Cutter” — will be run by the Tonic Nightlife Group, which operates several bars in San Francisco, including Tonic and Bullitt. 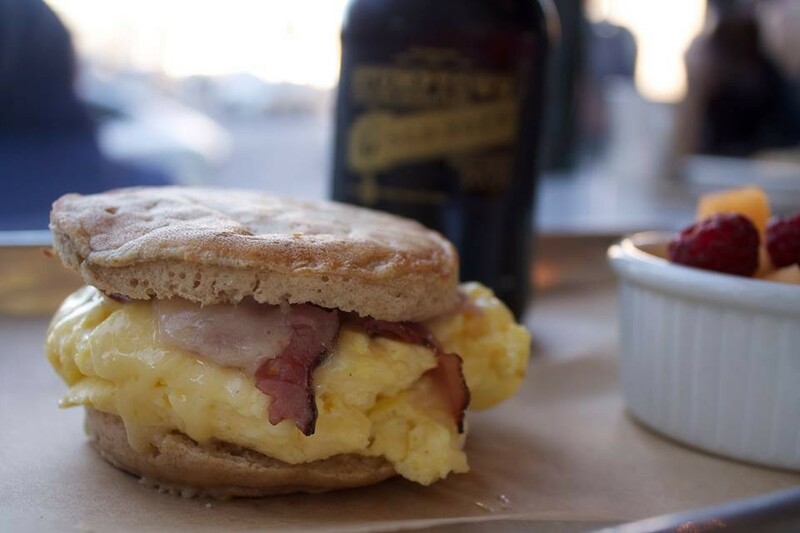 Flour and Co breakfast sandwich (via Facebook). 4) Also in Berkeley: According to Tablehopper, Flour & Co, a bakery in San Francisco’s Nob Hill neighborhood, will open a second location at 1398 University Avenue — the old Bread Workshop location. 5) Meanwhile, Downtown Oakland has a new bakery of its own. MAD Confections and Cafe (578 14th St.), a New Orleans-inspired bakery and cafe run by a group of pastry chefs headed by owner Robert Byrd, whose previous stints, according to his LinkedIn page, include pastry gigs at San Francisco’s 5a5 Steak Lounge and La Folie. Check out the menu, which includes beignets, a version of Southern biscuits and gravy, and a bacon walnut sticky bun. 6) The Uptown Oakland outpost of Off the Grid has moved to a different day of the week, Berkeleyside Nosh reports. The food truck gathering will relaunch on Thursdays, starting at 5 p.m. on February 5, at the intersection of William Street and Telegraph Avenue. Previously, the Uptown street food market had been scheduled for Mondays in part as a courtesy to nearby restaurants, many of which were closed then anyway. 7) The Ike’s sandwich empire is expanding — everywhere it seems, but specifically to a new location in Emeryville, Inside Scoop reports. Look for an opening date sometime this summer. 8) For those looking to brush up on their mixology skills, Flora (1900 Telegraph Ave., Oakland) is kicking off a series of monthly cocktail classes. The first of a two-part series on Manhattans and Old-Fashioneds will take place this Sunday, February 8, from 5 to 7 p.m. Each class costs $75, or you can sign up for the two-class series for $125. 9) Finally, ICYMI, Homestead is doing away with tipping in preparation for Oakland’s upcoming minimum wage hike, and the folks from Nick’s Pizza are opening a bakery and restaurant in the old Barkada space in Temescal.